This is one of the most important Romanesque buildings in Europe and a World Heritage Site. 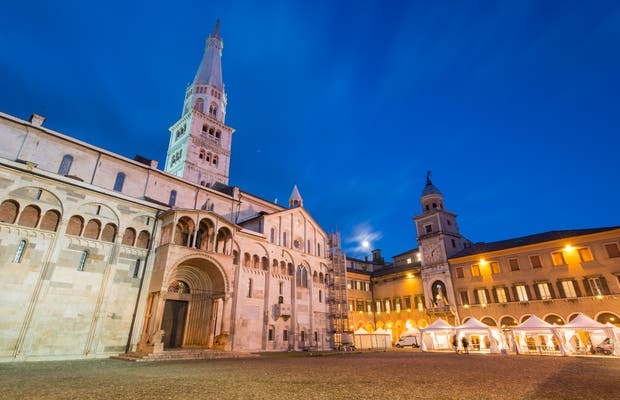 Construction started in 1099 under the direction of architect Lanfranco, where the tomb of St. Geminianus is, the patron saint of Modena. Since the V century, two churches were built in the same place, but both had been destroyed. The saint's remains are still exhibited in the crypt of the majestic cathedral. The rosette was added by Anselmo in the 13th century, while the two lions supporting the columns of the entrance are from ancient Roman times, and were probably discovered during excavation to lay the foundation.